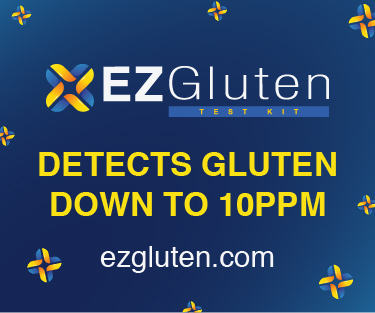 EZ GlutenTM, manufactured by ELISA Technologies, is an easy to use home test that will quickly detect the presence of gluten in foods. It is sensitive enough to detect levels of gluten as low as 10 parts per million (ppm). For reference, current FDA standards require < 20 ppm for gluten free labeling. This simple test is also small and portable for use at home and when traveling. 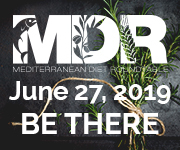 It can be used to test individual ingredients in foods, or to test finished and cooked products and beverages. In the EZ GlutenTM testing kit, a food sample is ground to a fine consistency, added to the gluten extraction solution, and then mixed. A few drops of the sample extract are placed into a test tube. The EZ GlutenTM test strip is placed into the test tube and allowed to absorb the sample extract. After 10 minutes, the test strip can be read for the presence of gluten in the sample. The EZ GlutenTM testing kit is also a good solution for testing prepping and cooking surfaces. ELISA Technologies also offers sterile swabs available for purchase. Please call (352) 337-3929 for more information.